This is my first english review, so if I got some mistakes please forgive me! I am still learning english writing. So, IF I MADE A FEW OR A LOT OF MISTAKES, PLEASE, TELL ME. I want to thank Sam Morrison for contacted me and asked me if I wanted to read this book. I've never read a book like this before. It was something new for me. The story it's about a killer who killed authors only, because in their books they made a mistakes, and she can't forgive them. So she kills them. The story it's short and I liked that because the author focused in the main character and their reasons to kill. It was very interesting read her and trying to understand her why she does what she does. The way she kills the authors was very creepy, and I was like wow, this is really weird. But the think I like most It was the reason why she killed them and her past was sad and, again, creepy. I recommend this book who likes gore and thriller and all that kind of books! I would have liked the book to be longer. THANKS TO THE AUTHOR FOR MAKING THE MAIN CHARACTER WOMAN. 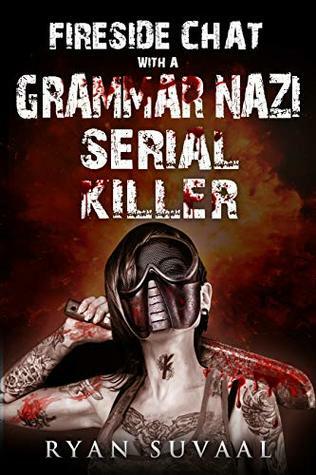 Sign into Goodreads to see if any of your friends have read Fireside Chat with a Grammar Nazi Serial Killer. 19.0% "Ok, this is gonna be my first english review." Congrats for your first english review! You had little mistakes that are almost invisible. So don't worry. You did it very well. It's a beautiful review Carolina. Thanks.